This three bedroom, three bathroom, Gulf-front Condominium is one of the highly-sought-after end units available in the St. Croix building! St. Croix 601 features more square footage than a typical three-bedroom condominium, to include a much larger Main Balcony, as well as a full third bathroom. The spacious Living Room with floor-to-ceiling windows and sliding glass doors immediately draws you through the home and onto the expansive Main Balcony. From there, you’ll absorb the breathtaking views of the sparkling emerald waters of the Gulf of Mexico, as well as the pristine dunes of Henderson Beach State Park. This vacation home is tastefully furnished with an emphasis on luxury, relaxation, and comfort, and imparts, “Welcome!” the minute you open the door! After you are able tear yourself away from mesmerizing views of the Emerald Coast from the Main Balcony of St. Croix 601, you and your family can relax and socialize in the sizable Living Area which features plush leather furniture and a flat-screen TV. Adjacent to the Living Area is the spacious Dining Area, Breakfast Bar, and newly remodeled Kitchen which is fully-equipped and boasts quartz countertops, new cabinetry, and stainless steel appliances. It is in this part of the home that you and your family can look forward to spending time together enjoying memorable meals and making memories that will last a life time! Next, your Master Suite, featuring a solid-wood, King bed, and flat-screen TV, has views of the beautiful, natural dunes of Henderson Beach State Park from a large picture window, and the vibrantly clear, blue-green waters of the Gulf of Mexico from the private entrance to the East end of the expansive Main Balcony. The luxurious en suite Master Bathroom features a jetted tub, a walk-in shower, and two separate vanities and sinks – giving you an abundance of space to get ready for any Destin adventure! The spacious first Guest Bedroom also has a King bed and flat-screen TV. Its private entrance to the generously-sized North-facing balcony combined with the pleasantly warm and inviting d��cor, this room instills a sense of serenity. The main Guest Bathroom is located only a few convenient steps away, yet remains easily accessible to the main Living Area. The second Guest Bedroom features two Queen Beds, a flat-screen TV, a private Queen Bathroom, and an adjoining entrance to the North-facing balcony. The St. Croix building is located in the center of Silver Shells Beach Resort, offering Gulf-front views and overlooking the expansive lagoon pool and deck. Beachfront vacationing at its best is what Silver Shells Beach Resort and Spa has to offer! 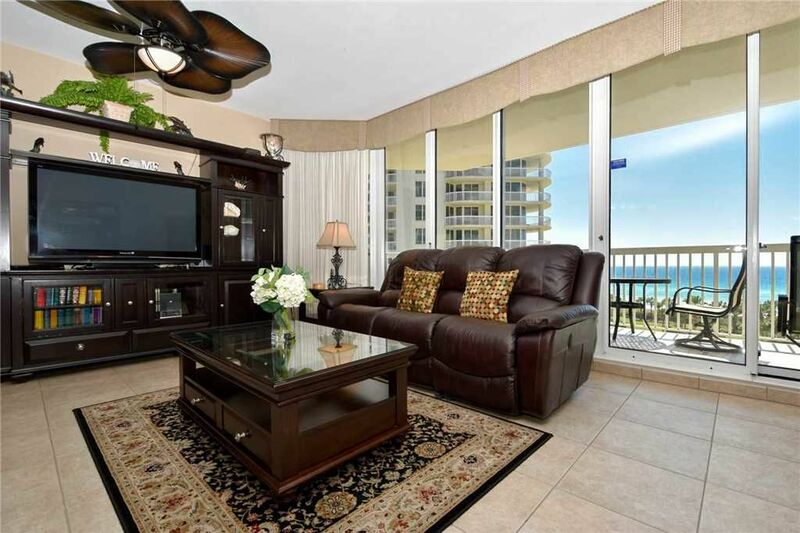 Located in Destin, Florida, this gulf-front, gated condominium features beautiful beaches, gulf-side lagoon pool, children’s pool, playground, hot tub, tennis courts, fitness center, European-style spa, Ruth���s Chris Steakhouse, tiki beach bar and grill, indoor/outdoor pool, BBQ grills, assigned covered parking, and close proximity to attractions, shopping, and dining; this property has it all! Destin is well known as the World’s Luckiest Fishing Village largely because of its roots as a top fishing destination and quick access to deep waters of the Gulf of Mexico. Destin boasts the largest charter fishing fleet in the state of Florida. If you have an interest in charter deep sea fishing – Destin is the place. But, there is much more to Destin than charter fishing. Destin has evolved over the years to be a top beach vacation destination. Featuring sugar-white sand beaches and emerald colored water, it is an absolutely beautiful area. The town itself offers many upscale shopping, dining, and entertainment opportunities. Much of the development of the area has been done with luxury lifestyles in mind. Destin also has one of the busiest private airports in the country. There are tons of things to do in Destin, water parks, water sports rentals, parasailing, scuba diving, snorkeling, power boating, sailing, fishing, tennis, shopping, or just plain relaxing on one of the world’s most beautiful beaches. Treat yourself to a great little beach town vacation – Destin, Florida located on Florida’s Panhandle. Bath towels, hand and kitchen towels provided. Guests should bring their own pool & beach towels. We have never been to Destin or stayed at Compass Resorts. Silver Shells was absolutely stunning! Everything was perfect! We will definitely be back again! We had a wonderful time and the condo was exceptional. The decor and ocean view was impeccable. A quick 3 day getaway. Words can't explain how beautiful this condo is! Everyone was just mesmerized at how nice everything was including the view from the balcony. It was a home away from home. Every little small detail was taken care of. We would definitely stay here again. Our family met here for the Thanksgiving Day holiday. The condo was perfect for our needs and had a great view of the pool and ocean. We had a minor issue and the management office took care of it promptly. Would highly recommend this resort and this condo! Will definitely be booking this property again! It was absolutely perfect for our family. Clean, nicely decorated, had everything we needed, and the view and ocean breeze was wonderful. Beautiful condo with lots of room. We enjoyed this unit very much. Comfortable beds. Nice amenities in the kitchen. Plenty of space to put your things while you stay. Only suggestions would be: 1. Add a hair dryer for the guest bedroom (with king bed); 2. Service the vent fan that kicks on every time you run the dryer. It vibrates and is very noisy in the guest bedroom (with king bed).